Disclosure: This is a compensated post in collaboration with Hunts and Latina Bloggers. As usual all opinions are my own. Thank you Hunts and Latina Bloggers for making NJB awesomeness possible! It’s been one Mexican celebration after another this week on NJB hasn’t it?!! I’m good with it, and so was the family, who got to enjoy all of these goodies. It started out with Chiles en Nogada, then sweet Almond Raisin Cookies, and ends with this to die for Torta Ahogada. Not too shabby for one week of food. 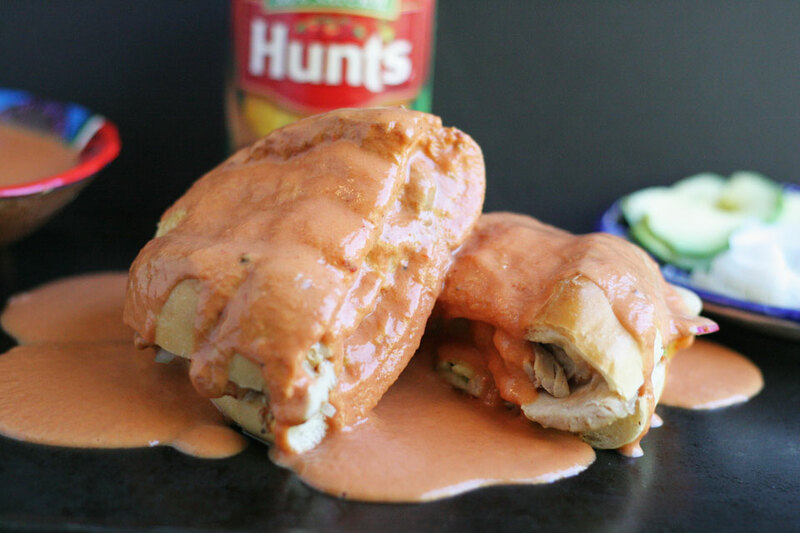 I am working with Hunt’s® tomato products for the chipotle cream tomato sauce that is typical of a torta ahogada that originated in Guadalajara, Jalisco, Mexico. Typical of a Latina, and Mexican household, we like to use high quality ingredients to make our often elaborate and delicious recipes. This recipe is no different. It’s cool because Hunts has no artificial preservatives and are 100% natural. 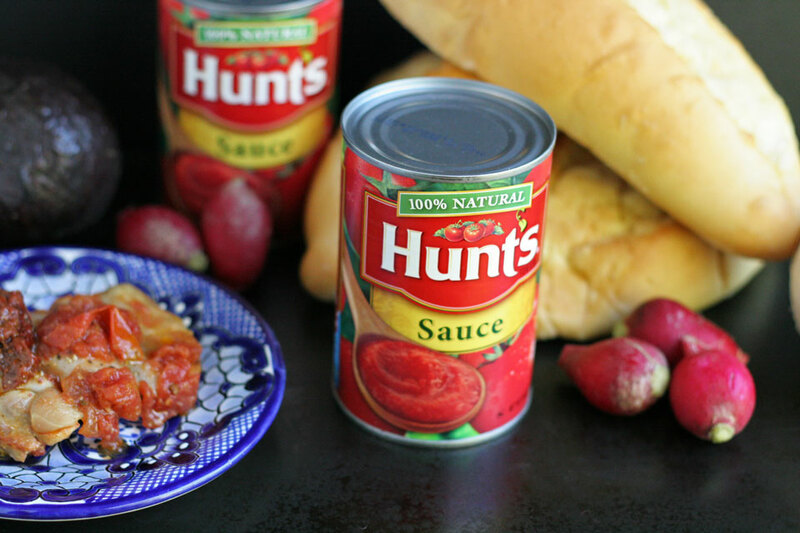 All of their tomatoes are grown in California which is a perfect climate for the red juicy tomatoes that are used to make Hunt’s all-natural Tomato Sauce. There is an abundance of Latin recipes that have tomato, so finding an easy way to a good quality tomato sauce makes those recipes that much easier to make at home. This recipe is just another example of Latinas in the kitchen learning from generation to generation. I came up with the idea for this recipe, and my Mama helped me make it. She gave me the tips and tricks to this sauce that covers the roasted chicken sandwich. It is very typical to use pork, but I wanted to use chicken. She finally gave in and said it was ok. I even suggested putting cheese on it, and she got mad lol! “No tiene queso esta receta!” Translation- this recipe does not have cheese! But I explained that people like melty cheese pictures and it will bring more people to the recipe, then she said it wold be ok, if it was for the greater good. 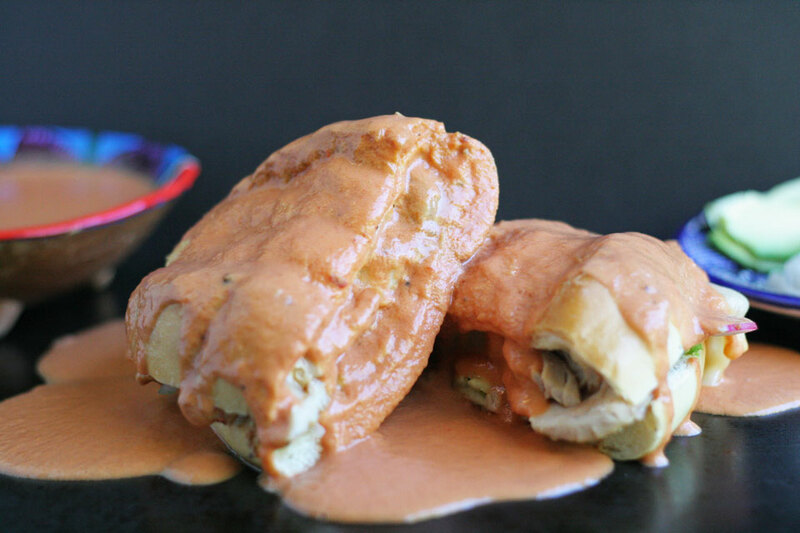 When we were talking about this torta ahogada recipe over dinner earlier this week, she told us a story that she used to live in Guadalajara near the famous torta store where these originated. Naturally I asked her to come help me make this sauce to get it just right. It was nice to enjoy that time making a famous and traditional tomato sauce recipe for torta ahogada. Super cool. You can find recipe just like this, and other tasty recipe on the Hunts Recetas website. You may even see this recipe up on their site one day! You can also add this hash-tag to your search on any of your social medias, and you are sure to find other recipes from Hunts, and Latina Bloggers for #FlavorServed! 6 slices good melty cheese, I used jack cheese, you could also use queso fresco, it’s not melty but it’s tasty! 1. Place chicken thighs in an oven safe dish. Cover with diced tomatoes, and chipotle chiles. Sprinkle with fine sea salt and pepper. Place in oven to cook for 1 hour. Cooked temperature should be 165. Remove and allow to rest for 5 minutes. 1. In a medium sauce pot over medium low heat, add the Hunts tomato sauce, whole chipotle chiles, salt and pepper. Stir to combine and cook uncovered for 15 minutes. Lower heat to low, add cream, stir, and taste for seasoning. Add fine sea salt and pepper is needed. Turn heat off. Remove chiles. 1. Slice torta bread in half. Place chicken on bottom side, followed by sliced avocado, sliced serrano pepper, sliced onion, and cheese, cover with top torta bread. 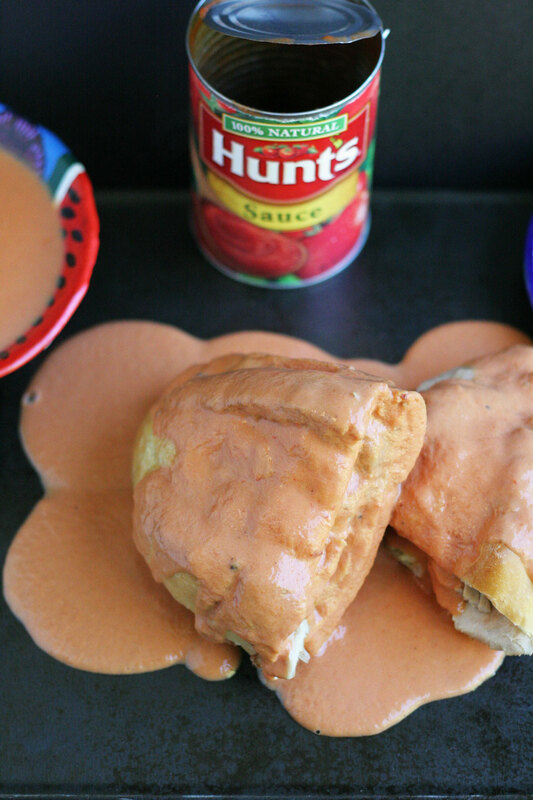 Place on individual plates, and ladel 1/2 cup of the Hunts tomato chipotle cream sauce and enjoy! I have never poured tomato sauce over my sandwich but I envision it tasting like when I dip my sandwiches in tomato soup. Which is my favorite ever! Love this recipe! Thank you! 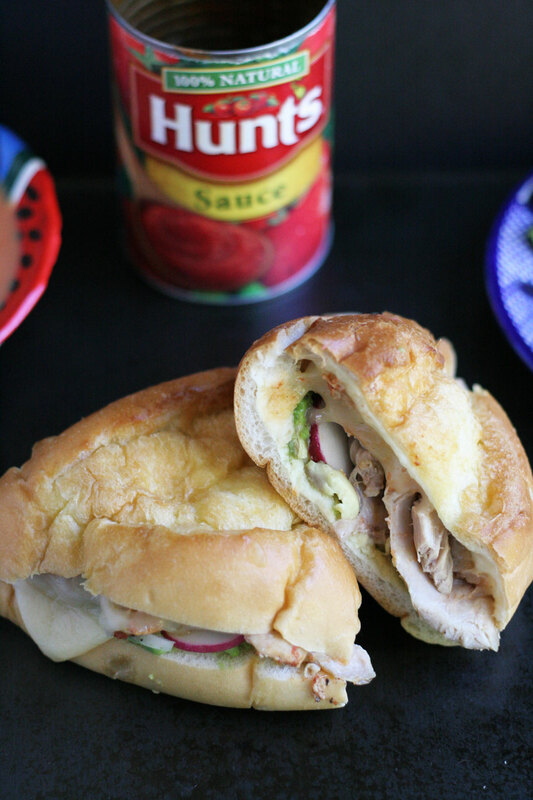 I grew up eating these tortas, they are to die for :).